One of the most beautiful hikes which you can make from Marrakesh leads through the beautiful mountain scenery of the Atlas to the eastern part of the Atlas region. High rock walls, deep gorges, lush valleys and panoramic viewpoints. The landscape is rich and varied. We will cross the plateau of the Ait Abdi, walk through the gorges of the massif Melloul and wade through the Akka N’Taghia. 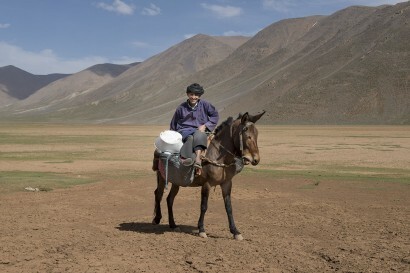 This is the high plateau where the nomads live in summer. The Berbers of the Ait Morhad and the Ait Addidou live together at the plateaus. We’ll also cross the living area of the Berber tribe of the Ait Atta. They were the most important Moroccan tribes between the 15th and the 19th century. You will see and meet the people of this region and explore this extraordinary region. A beautiful and sporty trek! Day 1: Flight to Marrakesh transfer to your Riad. Day 13: Return flight to Europe. Departure by international flight to Marrakesh. After arriving at the airport you are welcomed by our guide and brought to our accommodation. You will stay in a beautiful riad, which is located right in the old Medina. In the evening we will visit the Jemaa el Fna. This world-famous market changes every night into an outdoor restaurant and all sort of things are sold and shown. This ‘square of death’ , once offered a different kind of spectacle in the form of public executions after which the heads of the victims were displayed on poles. We stay in a riad, based on bed and breakfast. After an early breakfast we depart by 4 x 4 vehicle to Imilchil. This journey will take approximately 8 hours. We will picnic in the forest, just before the village of Aghbala. The route takes us through the plain of Haouz to the mountains of the high Atlas. Then we will pass Beni Mellal and climb to the plateau of Imilchil. At the Lake Tislit ‘s, where we will set up our encampment, the donkey drivers with the pack-donkeys are waiting for us already. A narrow path finds its way to the plateau, where Imilchil is located. The plateau, surrounded by the high mountains of the Eastern Atlas, bends gently towards the entrance of the gorges of the Assif Melloul. The encampment will be in Oudiddi. Walking time: 5 hours. In two days we will descend to the Assif Melloul. Up to Oulghazi, the area is uncultivated and there are no villages due to the flow of the river. We will pass a forest and the landscape becomes increasingly ferocious. During our trek we may passsheep flocks with their shepherds. The second day we will arrive at the village of Batli. We will wade through the water a few times. We we will set up our encampment in Batli. Duration: (Walking time; 7 hours each day). After breakfast we will hike up the mountain. We will walk amidst pine trees to the Dari pass, from where you will have a magnificent view over the valley of Anergui. Gradual descent to Ait Boulmane in the Assif Melloul. The afternoon is at leisure. You can swim (Club Med Berber!) and visit Ait Boulmane. We will spend the night either in people’s homes or at our own encampment. (Walking time: 4 hours). Day 7. Aït Boulmane – highland Anou Nasser (2300 m). We will climb to the highland of Anthony over a very nice mule track. There is little water on this highland. We we will set up our encampment in Ait Tous, near the only water point. Here the shepherds of the Ait Abdi come together. (Duration: 6-7 hours). We cross the highland and descend to some troglodyte houses, which nowadays is still used by the Ait Hdiddou at the time of transhumance (= season stretch with cattle). Afterwards we will descend into the valley of the Assif Ahançal. We will camp upstream the Zaouia Ahançal at Tighanimine. (Walking time: 7 hours). Day 9. Tighanimine – Taghia gorges (2000 m)-Tighanimine. Fantastic walk near the entrance of the Gorges of Taghia. Through a small, steep path we reach the village of the same name. The gorges are very impressive. It is possible here to swim and relax. Afterwards, we will walk back to the camp site in Tighanimine. Walking time: 4 hours. Day 10. Zaouite Ahnsal – lake of Binalouidane. We say goodbye to the Mule drivers and travel by 4 x 4 vehicle to the Lake of Binalouidane. We will drive through beautiful scenery with different colored rocks. Picnic by the confluence of two rivers. Then we continue our route and pass through two villages, before we arrive at the lake of Binalouidane. We spend the night in private homes or in a hotel. Day 11. Lake of Binalouidane – Lake from Takrkouste. Today we drive back to Marrakesh. We will have lunch in Azilal, then we will drive to the lake of Takrkouste, which is located 30 km. from Marrakesh. We will spend the night in a local riad. Day 12. Lake of Takrkouste – Marrakesh. After a relaxing breakfast and swimming in the lake we will travel back to Marrakesh, where we will spend the remainder of the day. Overnight stay in a local riad. Day 13. Return flight . We accompany you to the airport of Marrakesh for your return flight. Our beautiful trip ends here and we say our goodbyes. Price per person depends on the number of participants. Please contact us for more information.